The carnage of BGW31 is now behind us and we can happily stop replaying Fraser’s shot hitting the post or Callum Wilson’s attempt being cleared off the line over and over in our minds. The upcoming double gameweek allows us the opportunity to banish those memories once and for all and look to record the sort of monster score 15 fixtures in a gameweek allows us. Ahead of DGW32 I’ve again had a look at the most consistent players, most explosive players and those which attract bonus points. 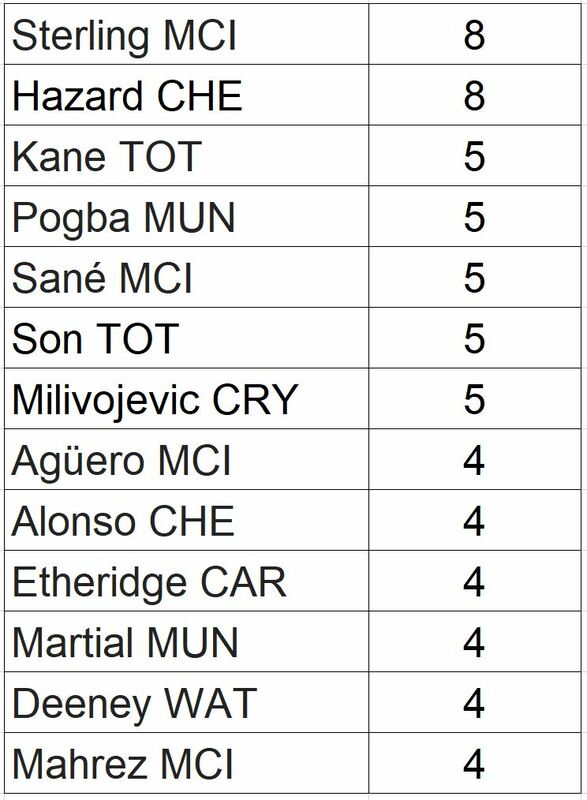 The table below shows the DGW32 players with the most 4+ point scores this season. It’s no surprise to see FPL stalwarts like Sterling, Hazard, Kane and Aguero at the top of this list. However the fact Jimenez is matching them with 17 games with 4+ points is a testament to the exceptional season he is having and it’s no wonder he’s now priced at 6.8m having started the season at a mere 5.5m. His exertions during the international break and Wolves forthcoming FA Cup semi final cast doubts over his level of participation in the DGW but his record compared to other similarly priced players surely makes him worthy of consideration. The Chelsea and Man City defences both feature prominently with Alonso, Azpilicueta, Luiz, Ederson, Laporte and Walker all having registered 4+ points on at least 13 occasions this season. Leroy Sane was the villain of DGW25 scoring just 1 point for the thousands who trusted him with the triple captaincy and those memories will make many reluctant to select the German in DGW32 despite his 13 scores of 4 or more points so far. 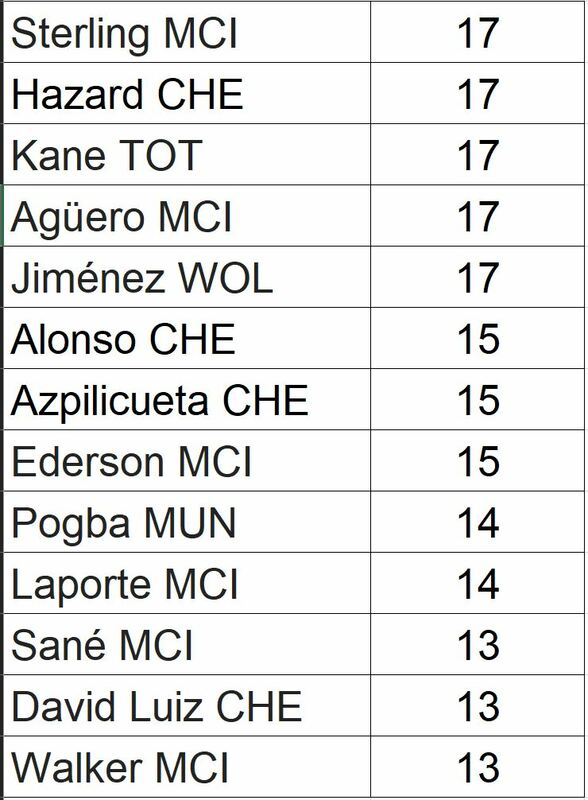 The table below shows the DGW32 players with the most 10+ point scores this season. Two of the players that looked most in form for their national sides, Sterling and Hazard, top the list of DGW32 players with the most 10+ hauls and it would be a brave manager that goes without them this gameweek. Of the group of 5 players that feature next on the list with 5 double figure returns perhaps the most surprising is Milivojevic, who has hit 10+ points more often than Sergio Aguero this season. Sane is also on 5 returns of 10 or more points this season and the aforementioned reluctance of managers to go back to him after the DGW25 shambles could make him a decent differential for Suj this gameweek. Some of the names on 4 double figures returns also have differential potential with Martial, Deeney and Mahrez all owned by less than 5% of the game. Martial and Mahrez would be riskier punts given the injury and rotation concerns about each respectively but Deeney is arguably the most in form player heading into the gameweek with an average of 5.6 points per game over the last 10 gameweeks and an average of 8 points per game over the last 4. The table below shows the average bonus points for DGW32 defenders recording a single return (Clean sheet, goal or assist) and the average bonus when recording just a clean sheet. The recent birth of Victor Lindelof’s child has eased concerns that he could miss one or both of the DGW games and given he has averaged 1.13 bonus points per single return he looks the pick of the United defence ahead of their games against Watford and Wolves. Stones and Wan-Bissaka have the best record for bonus points when recording just a clean sheet with both players averaging 1 bonus point in those situations. Interestingly Palace defenders seem particularly adept at attracting bonus points with Sakho, van Aanholt and Wan-Bissaka collectively amassing 8 bonus points this season in games where they have no FPL return. 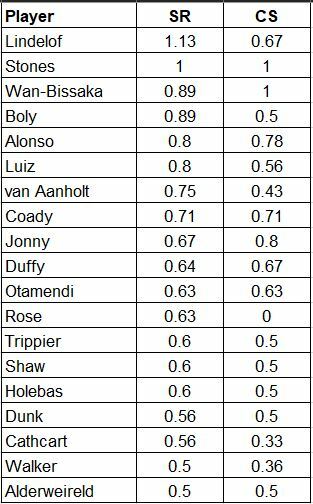 Wolves defenders also do well for bonus points with Boly (0.89), Coady (0.71) and Jonny (0.67) all in the top 10 for bonus per single return although popular pick Doherty has 9 games with a single FPL return without registering a bonus point in any of them. The table below shows the average bonus points for DGW32 midfielders and forwards when recording just a single goal. Hazard, Milivojevic and Jimenez all average more than 2 bonus points per single goal and all 3 may well be popular picks for those using the free hit chip this gameweek. Jimenez’s ability to collect bonus points from a single goal compensates slightly for any concern over his minutes as it’s plausible he could hit double figures with just a single goal over the course of the two games. David Silva is the pick of the Man City players with 1.83 bonus points per single goal but with Aguero and Sterling seemingly nailed on for most people’s first two City spots, and De Bruyne nearing fitness, Silva may prove to be a differential this week with many opting for a safer defensive option for the triple up. Pereyra has done well with bonus points on single returns this season with an average of 1.75 but appears to have taken over Richarlison’s mantle at Watford with 10 attacking returns in the first half of the season and nothing in the 11 gameweeks since. The forthcoming double gameweek poses a few more conundrums than the seemingly established Twitter template would have you believe. Will the expected rotation of good value Wolves and Watford assets actually materialise? Will those who gamble on a 3rd City attacker outscore those who play it safe with the defence? Are Sarri’s Chelsea worth a triple up? There is clearly logic behind the template team that has formed but also plenty of scope to go against that logic and come out ahead points wise, I just need to decide now whether Troy Deeney can ever be answer to an FPL related question.